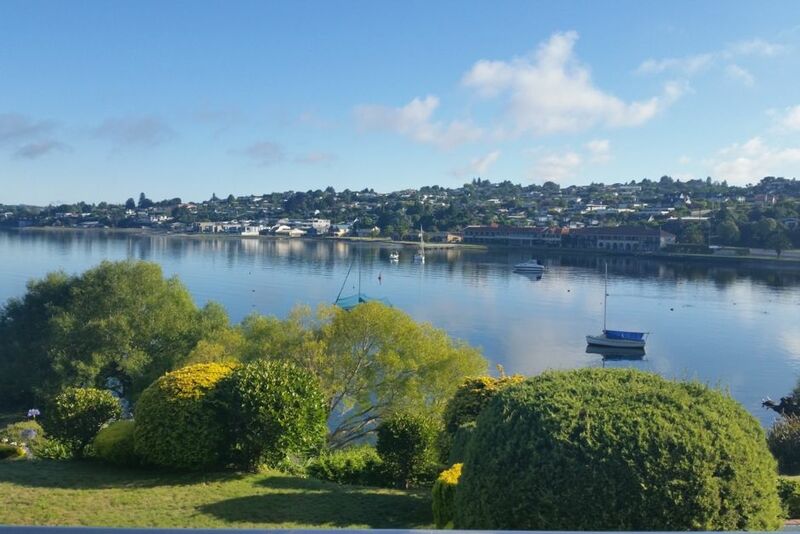 A beautifully appointed apartment in a gated community on the shores of Lake Taupo. This sunny apartment is flooded with natural light and has a very spacious feeling with 2 bedrooms and bathroom on the mezzanine floor - both with balconies overlooking the lake. Downstairs a fully equipped laundry, kitchen, dining area and another bedroom and bathroom. The spacious lounge, with wood burner, opens out via bi-folding doors to a private patio and BBQ area overlooking the lake. Not suitable for small children. Perfect for a getaway with friends or just a relaxing weekend. A 10 second walk to the lake, 30 minute walk to town and a 5 minute stroll to the Millennium Hotel and the renowned Edgewater Restaurant. Pricing for Cycle Challenge, Iron Man, Summer Concert and all "SPECIAL" weekends is $500 per night for up to 6 people plus $100 cleaning fee. I'm a widow sharing my favourite place. Fantastic location and absolutely tip top property and furnishings. You'd have to be very very picky to find anything to mark it down. The house is just beautiful with direct access down to the lake and full lake views! Easy walk into town and it is a quiet location. We have stayed here 5 times now and always look forward to our trip every year. Gorgeous property with magical outlook. We had glorious weather for 10 days and as always - loved the property. We keep on returning to this beautiful home. Fabulous home with beautiful outlook over the Taupo lake. Fabulous home with beautiful outlook over the Taupo lake. Everything in the home is in tip top condition. We just keep coming back. Thank you so much. My place is ideally situated, close to town, shops with a thriving holiday atmosphere. Heaps of things to do. A trip to Huka Falls is worth it.